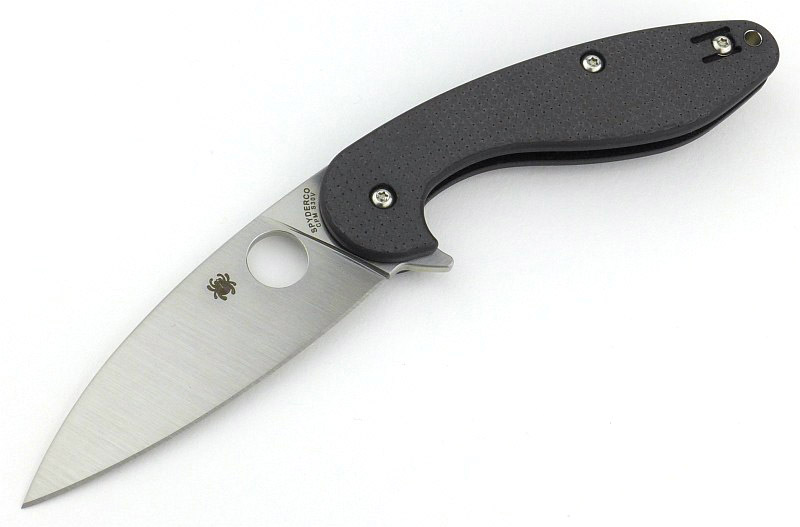 The Spyderco Sliverax is a design by automotive engineer and knife enthusiast Paul Alexander. 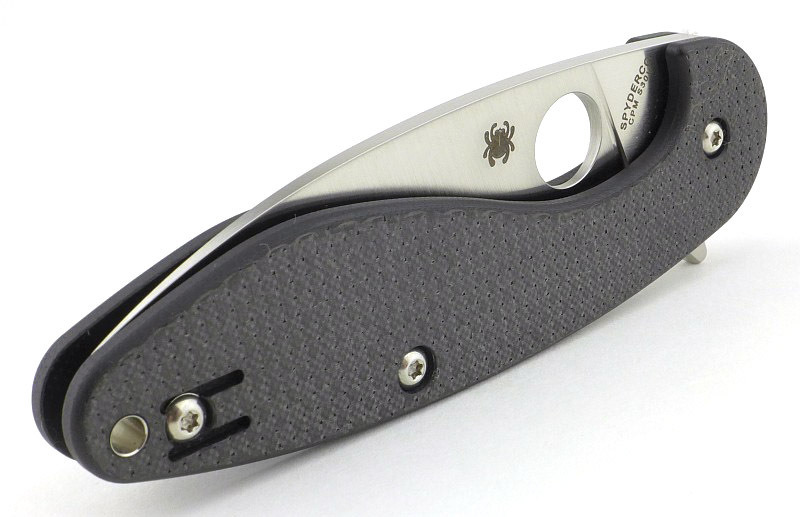 It is the first production folding knife to combine a flipper opener with Spyderco’s Compression Lock mechanism, and is Paul’s second collaboration with Spyderco. Sleek lines and a pronounced positive rake to the blade give the Sliverax a distinctive and purposeful look. 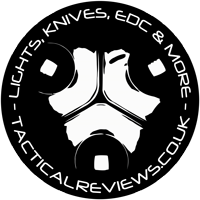 Tactical Reviews is known for very detailed reviews using many high quality images. This has meant quite a lot of scrolling to read most reviews. In the new format, the review contains ‘responsive image galleries’ to better display these images as a slide show with captions. NOTE: On a PC it is best to use the arrow keys to move through the images. Captions can be hidden by clicking the small ‘x’ in the caption box. To enable them again, close the gallery and reopen it. Things to look out for here are included in the image captions. 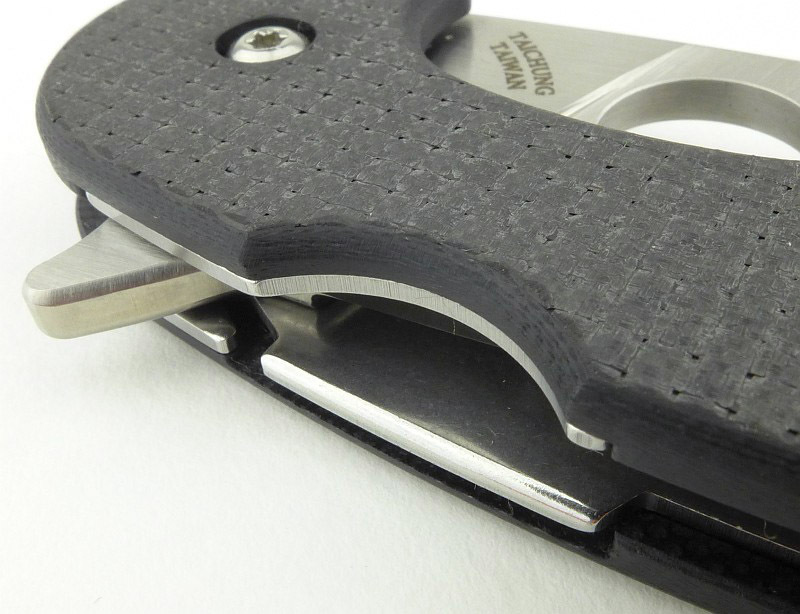 The Sliverax is an extremely sleek design. 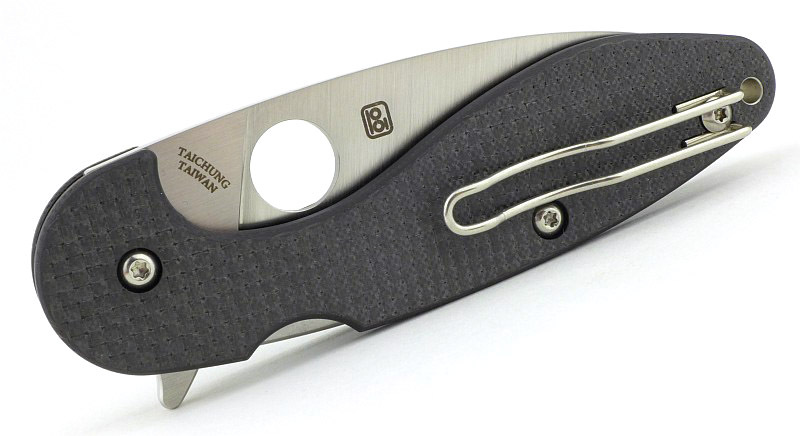 No surprise to see a Spyderco wire pocket clip. 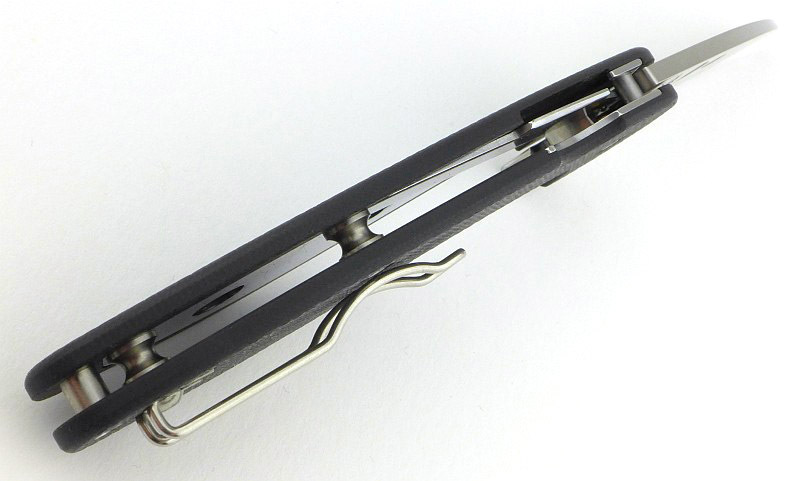 The clip can be mounted for right or left-handed users. 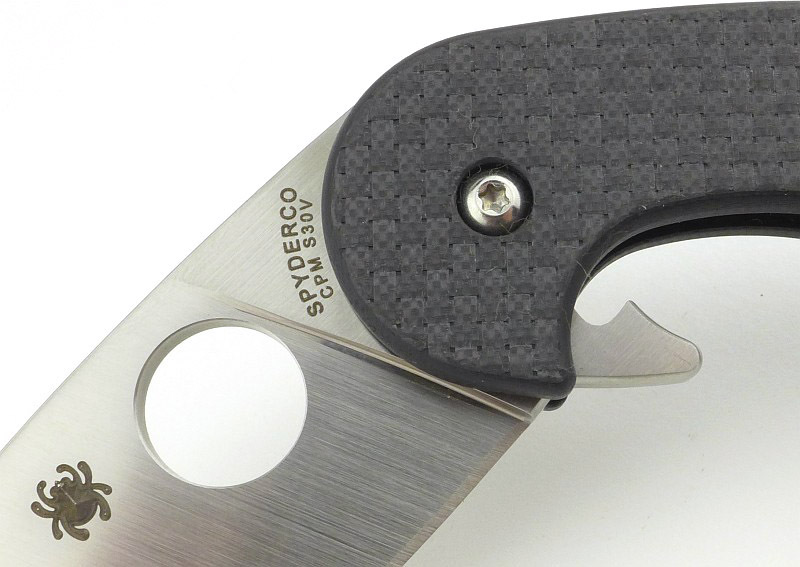 The large opening hole is fully accessible from both sides when the blade is closed. 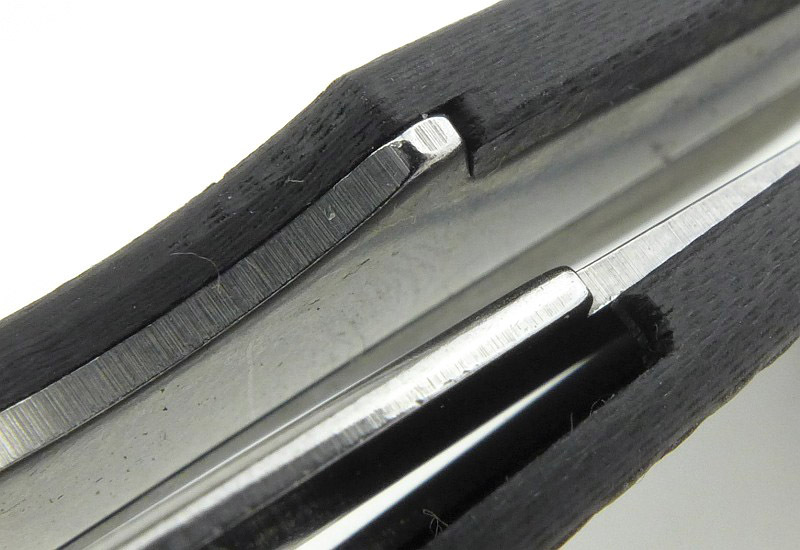 With the blade part open you can see the stop-pin cut-out at the base of the flipper tab. 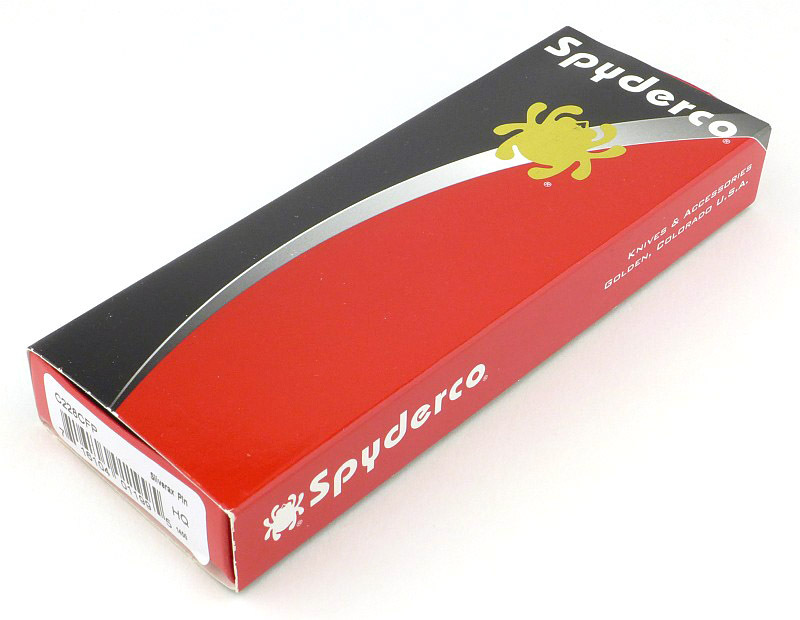 Spyderco's compression lock is used. 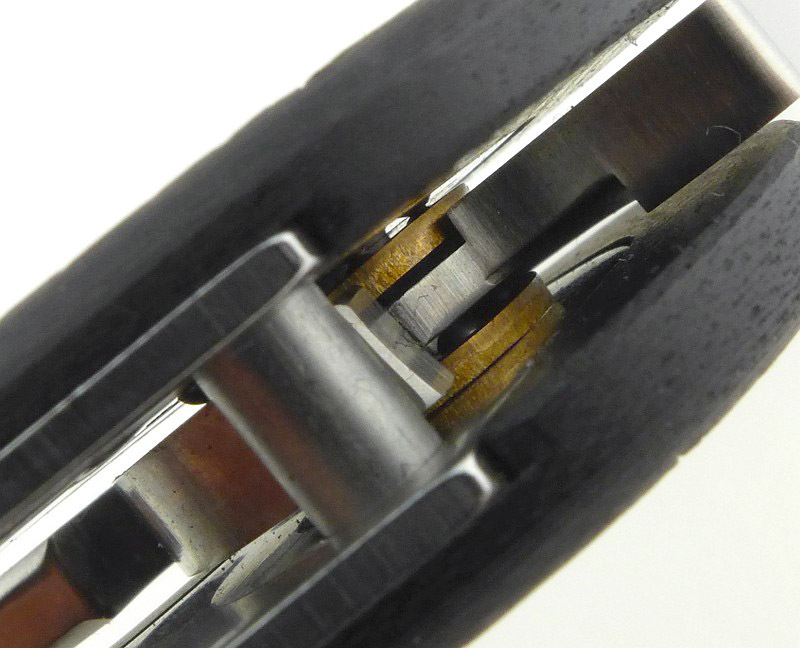 Captive ball bearings make the blade movement super slick. 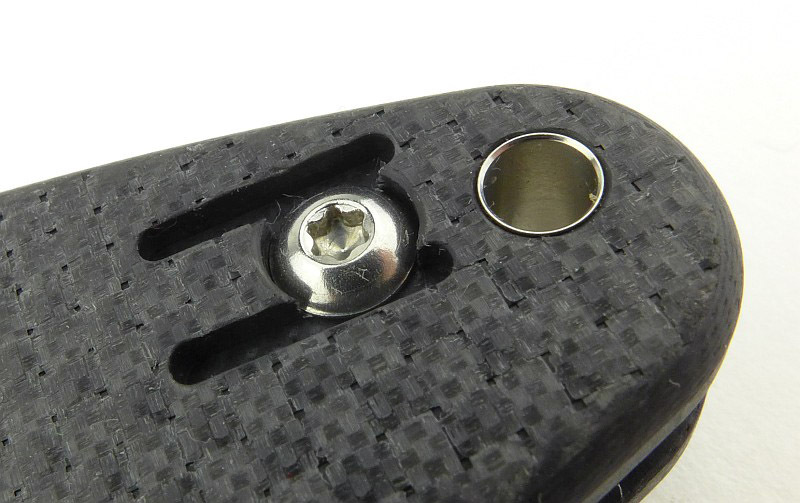 A closer look at the handle Carbon Fibre / G-10 Laminate texture, here shown with the pivot bolt. The Sliverax is an open back design with waisted spacers. 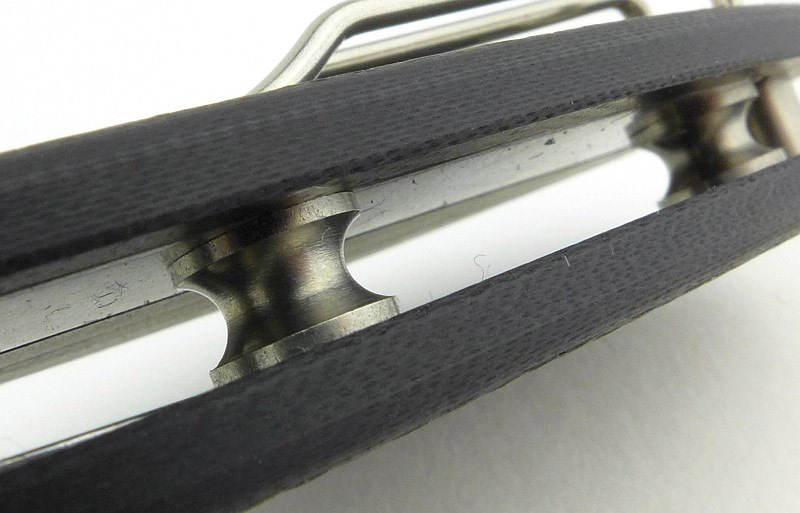 The liners and lock bar are nested into the handles. 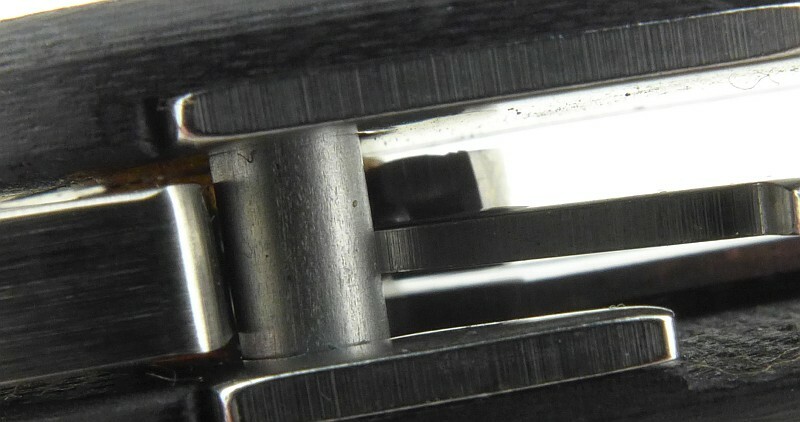 A close-up of the lock engagement. A well back-swept plunge line makes the cutting edge longer than the blade length. 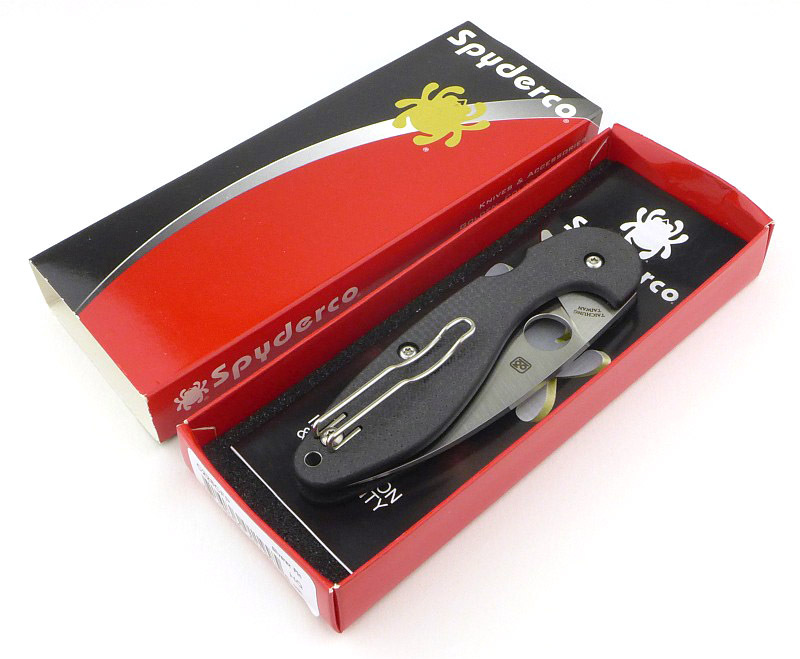 From Spyderco’s product description “Designed by automotive engineer and knife enthusiast Paul Alexander, the Sliverax is the first factory-made folding knife to combine Spyderco’s Compression Lock™ mechanism with a flipper-style opener. 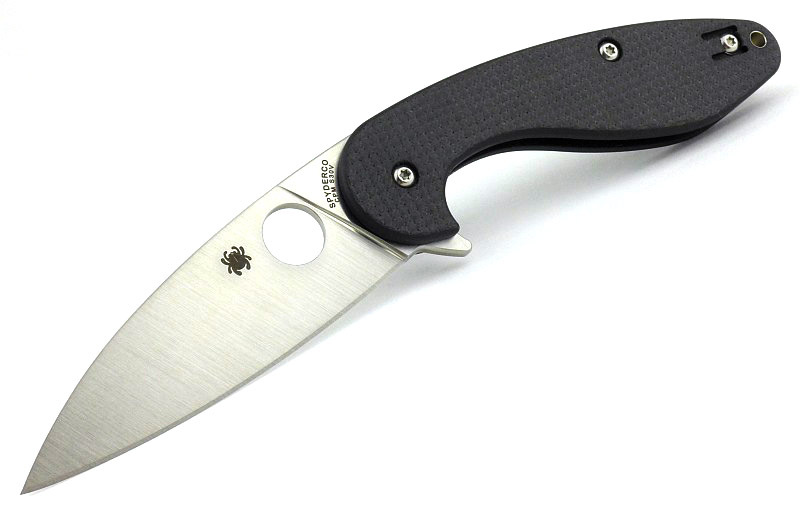 Its sleek drop-point blade is crafted from CPM® S30V® stainless steel and proudly includes both a fully accessible Trademark Round Hole™ and an index-finger flipper to support a full spectrum of one-handed opening options with either hand. A full-flat grind gives it outstanding edge geometry and its slightly negative blade-to-handle angle enhances its cutting leverage and shortens its opening arc for swift, positive deployment. 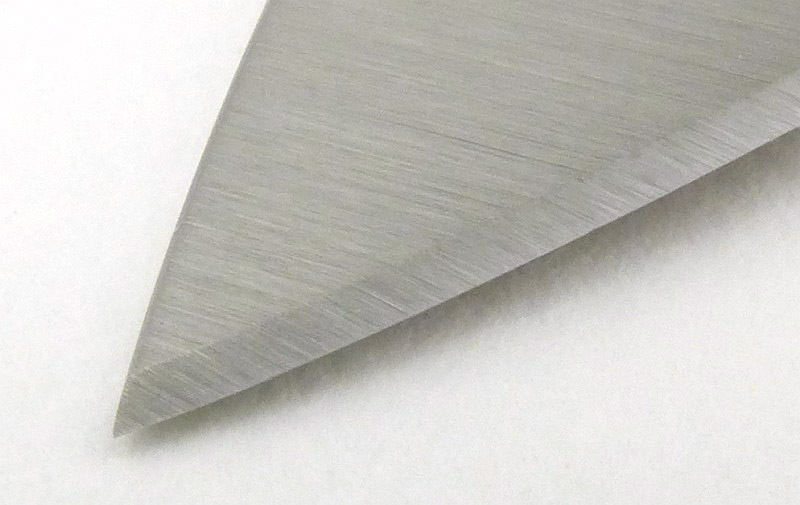 Most knife specifications have a basic description of the blade geometry, but in this section I will be taking a more detailed look at geometry and balance. 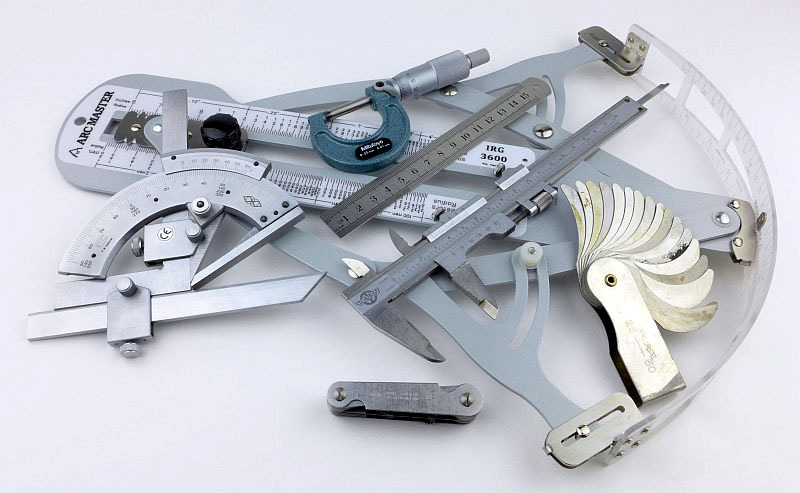 Using a set of gauges and precision measuring equipment including a Vernier protractor, callipers, fixed radius gauges and the unique Arc Master adjustable radius gauge (the one that looks like a crossbow). These measurements have been tabulated and are presented along with a few reference blades (8″ Chef’s Knife, 5.5″ Santoku and the popular Fällkniven F1). 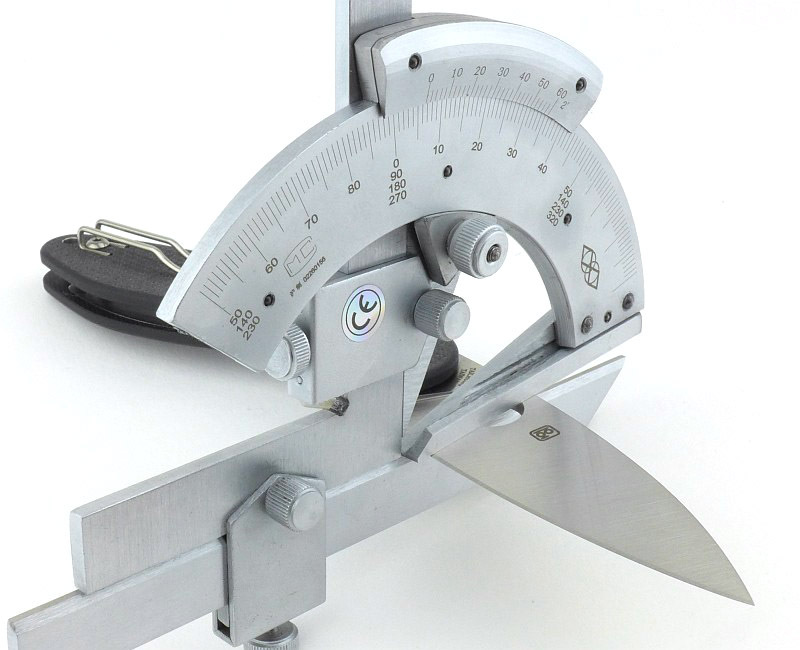 Key aspects such as the primary bevel angle, grind type, blade depth, blade thickness, length, weight are detailed, along with balance information. 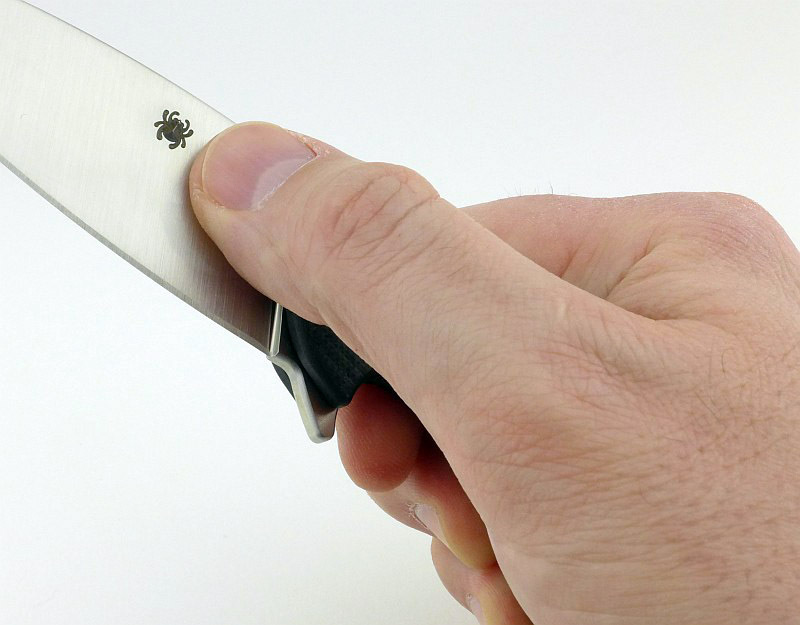 The ‘Balance relative to the front of the handle’ tells you if the knife will feel front heavy, or if the weight is in your hand (a positive value means the weight is forward of the front of the handle). 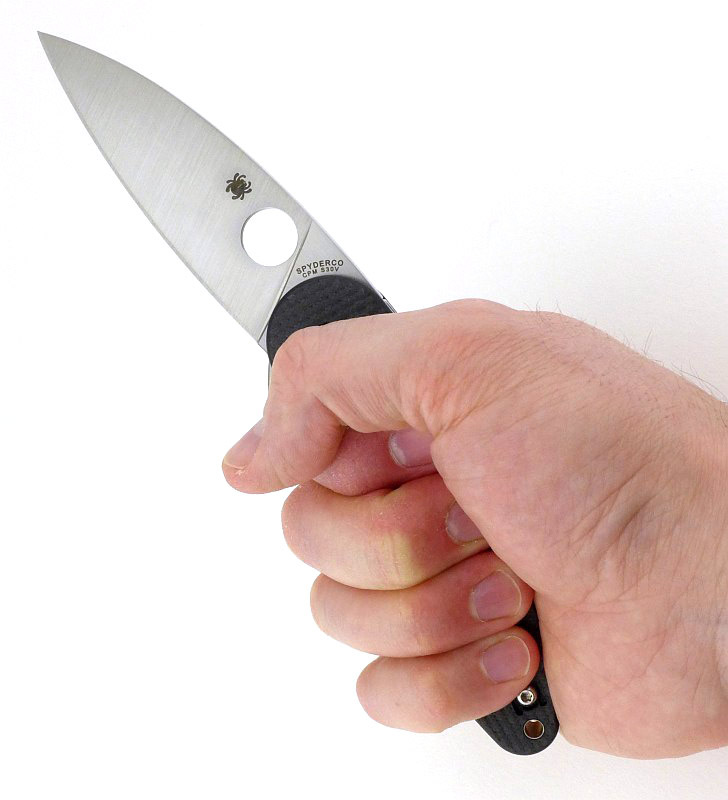 The ‘Balance relative to the centre of the handle’ indicates how close to a ‘neutral balance’ the knife has in the hand. In the case of full convex grinds the approximate centre of the grind is used for the primary bevel angle estimate. 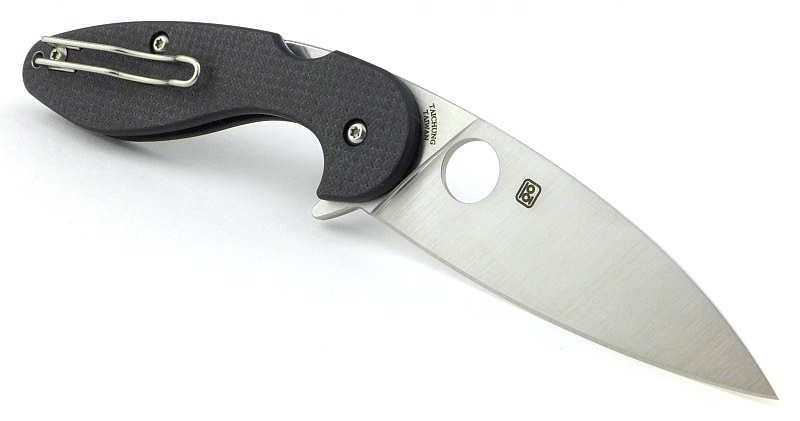 The blade is made from CPM S30V steel. 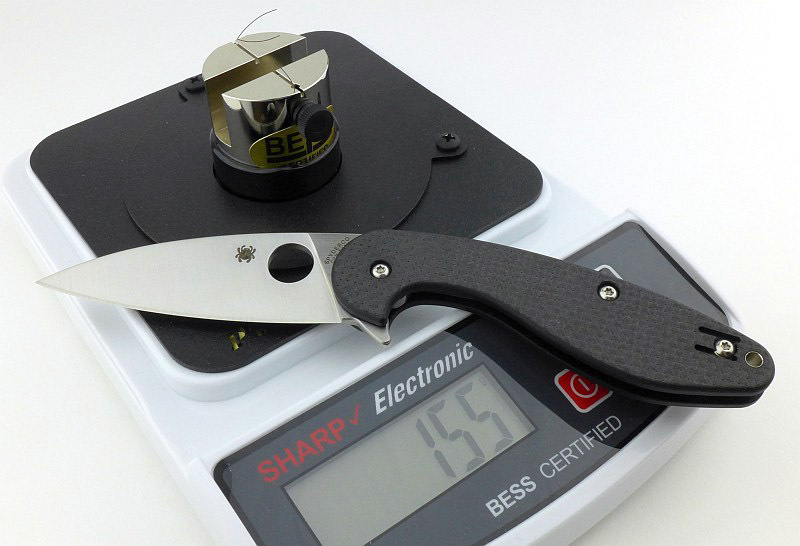 The BESS ‘C’ scale of sharpness, developed by Mike Brubacher (Brubacher Edge Sharpness Scale) will now become part of Tactical Reviews’ knife testing process. 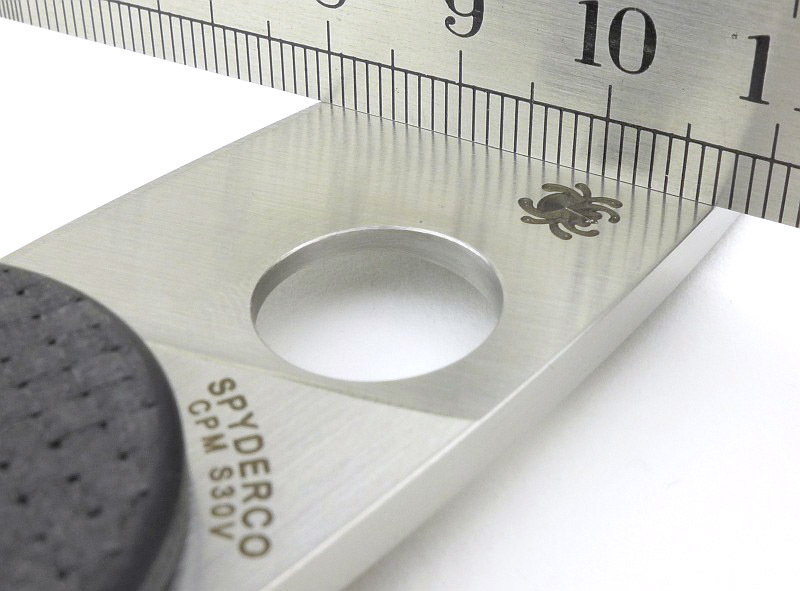 Initially this will be used to verify the sharpness of the factory edge and allow the knife to be brought to a minimum standard sharpness before testing a blade’s cutting performance. 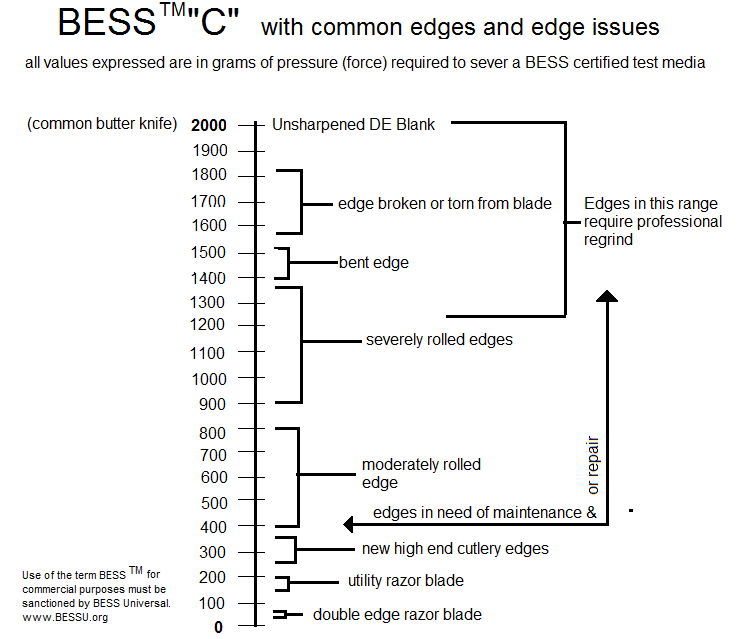 The Sliverax’s factory edge has an average BESS ‘C’ sharpness of 186. 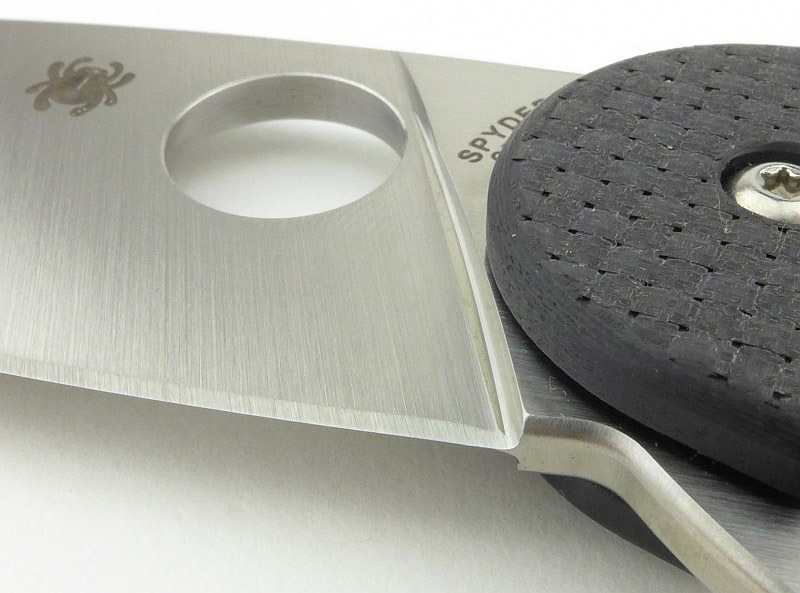 This is yet another super sharp factory edge from Spyderco. A figure less than 200 is really good and easily shaves arm hairs and falls through 80gsm paper. 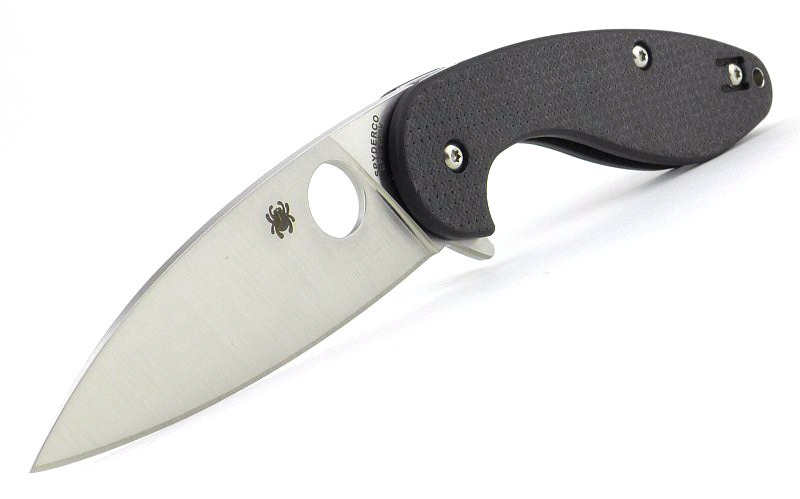 What struck me on initially handling this knife is how the Sliverax differs from conventional folders with its organic lines and purposeful downward angled blade (positive rake). When folded it is almost like a worry stone in its pleasing feel and curvy shape. Opening is lightning fast with the flipper, and this speed is in part due to the blade’s positive rake, meaning the blade only has to rotate 160 degrees to open, instead of 180 degrees. 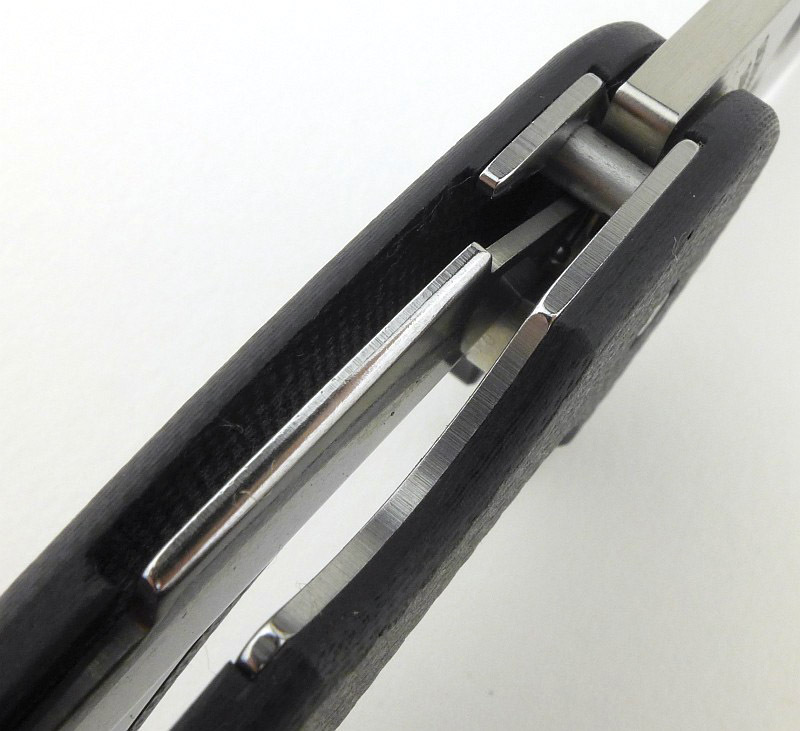 Of course the pivot’s captive ball bearings also guide the blade with virtually no resistance at all. 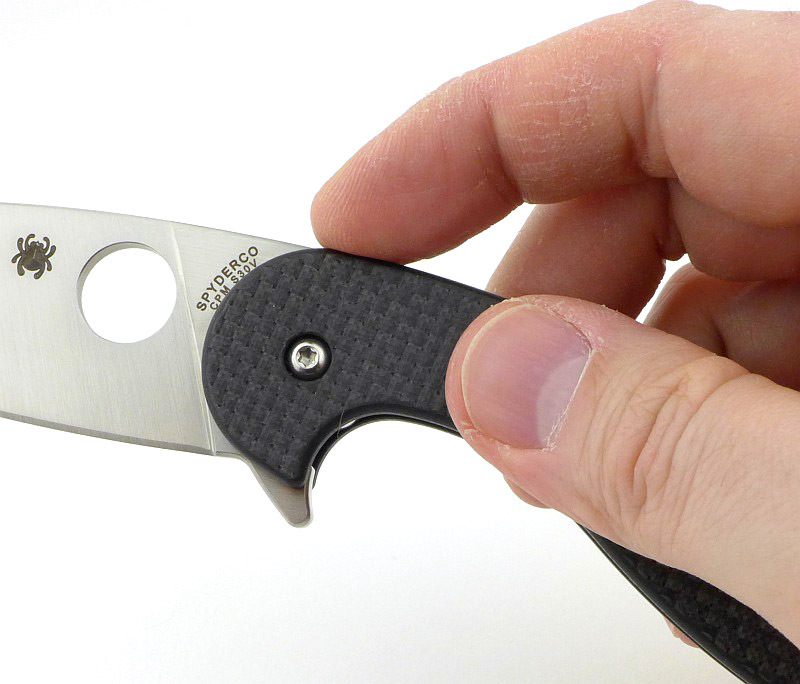 Having a fully exposed opening hole from both sides makes it very comfortable and easy to thumb-open with either hand. 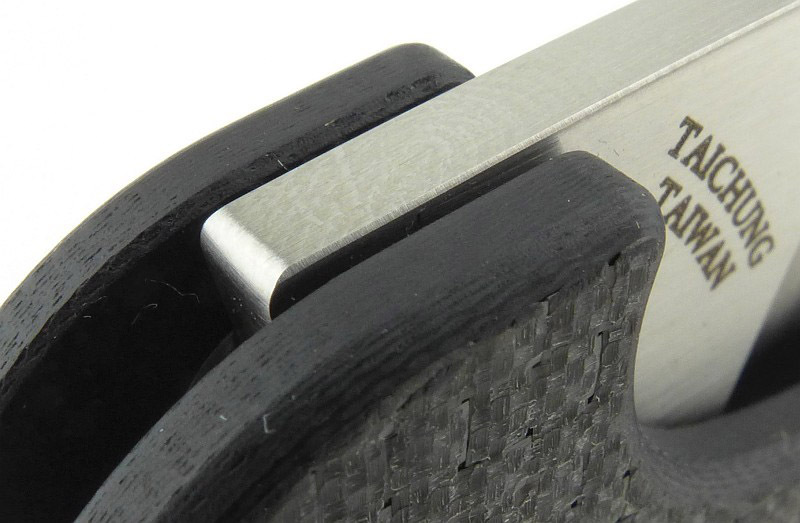 The clip can be fitted to either side, so the Sliverax is truly ambidextrous. The only aspect that is slightly handed is a one-handed close. I certainly found it easier to unlock the compression lock one handed using my right hand. 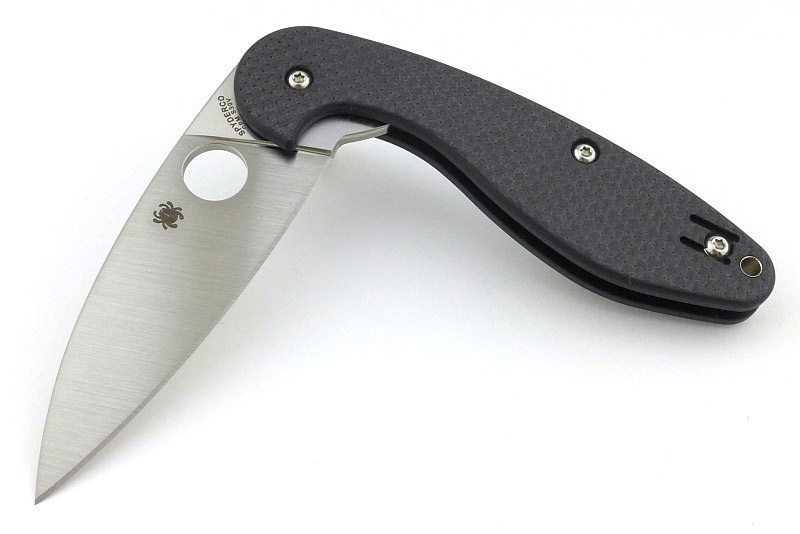 For the opening hole to be fully exposed, and to not have a Spyderco ‘hump’, a lot of the handle has been cut away making the handle at the first and second fingers very thin. As well as accentuating the rake of the blade further, it also makes a full hand grip a little awkward as the fingers don’t have much to hold. However it does provide a deep finger guard so the chance your hand might slip forward is very low. I tend to prefer thumb-opening blades for several reasons. 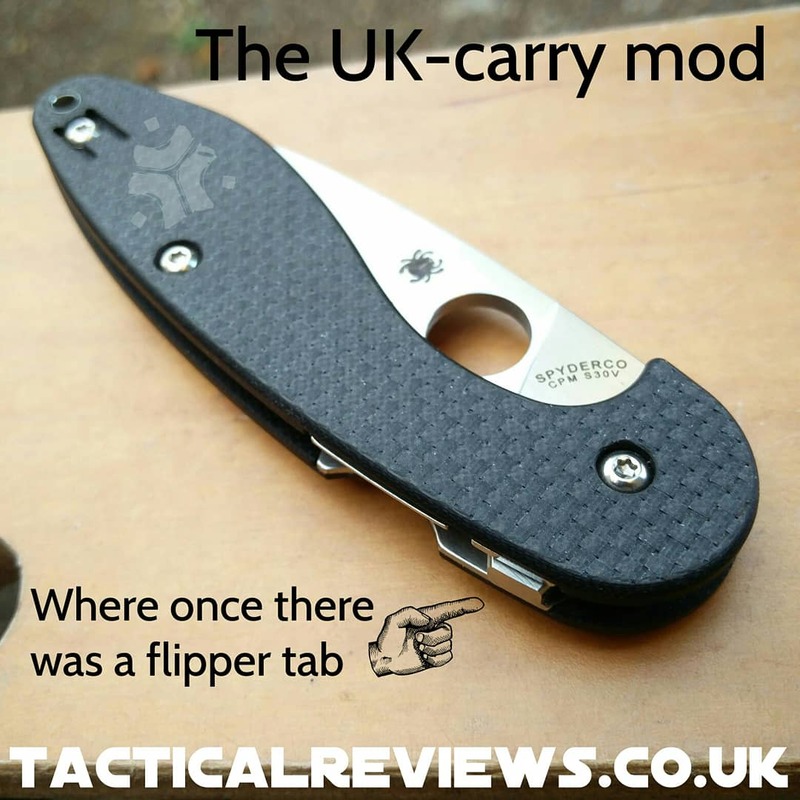 In fact, in the UK where I am based, flippers are too close to switchblades for comfort, so a nicely controlled thumb-open goes down much better. This leads me to make an observation about the compression lock which I also noted on the Sharman. 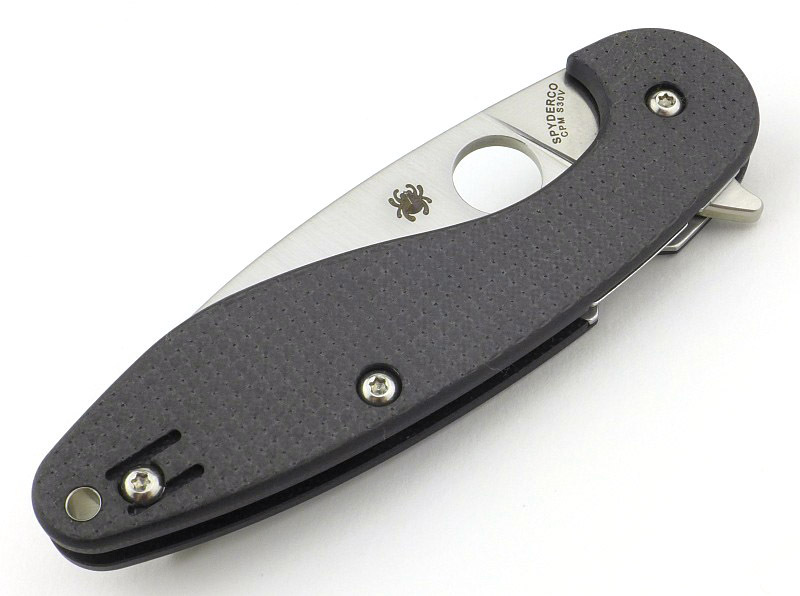 As I open the blade, my first finger tends to lie over the lock itself, and the lock bar often gives me a little nip as it snaps into place. A minor complaint and easily avoided (if you remember) but mentioned here as an observation. Despite being a smooth finish, the Carbon Fibre/G-10 Laminate handle has enough texture to provide positive grip even when wet. 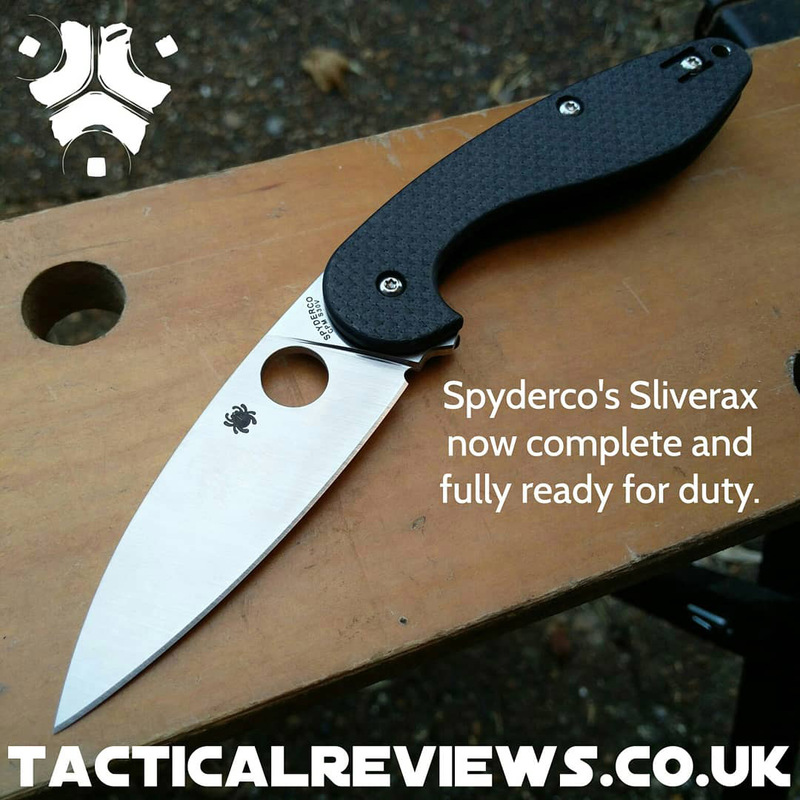 The Sliverax is an excellent size for a general purpose blade. 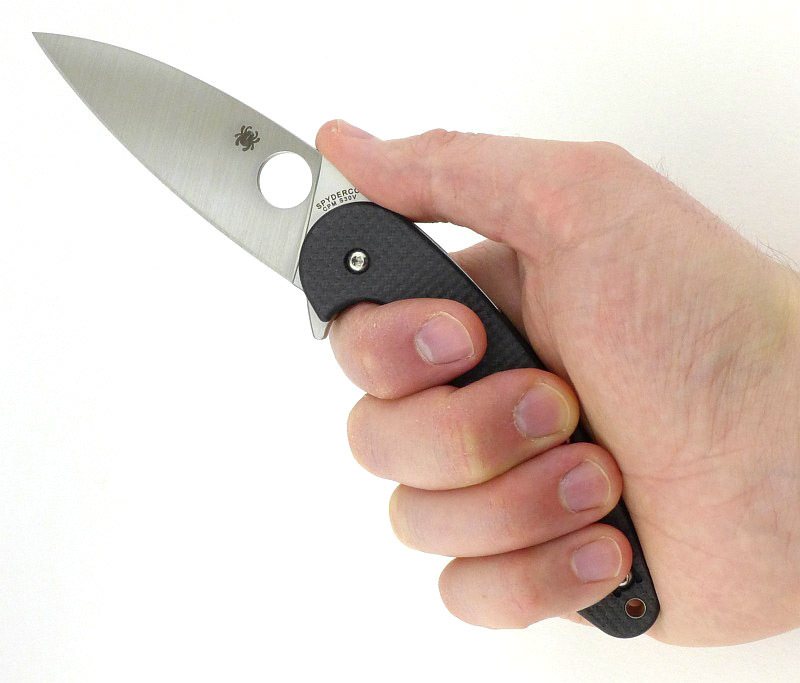 A full fist grip is a little awkward with the large cut-out of the handle making it very narrow. Overall feel is excellent with the edges all finished to a very refined level. Opening via the flipper is lightning fast. Thumbing it open is exceptionally smooth. And locked. I did get a few nips from the compression lock snapping into place. 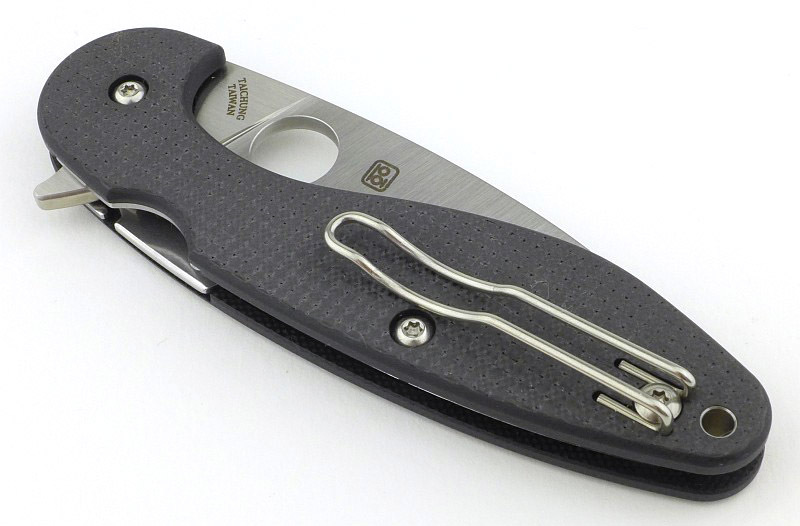 Even without the ‘issue’ of appearances in the UK, I am personally a bit tired of the flipper. 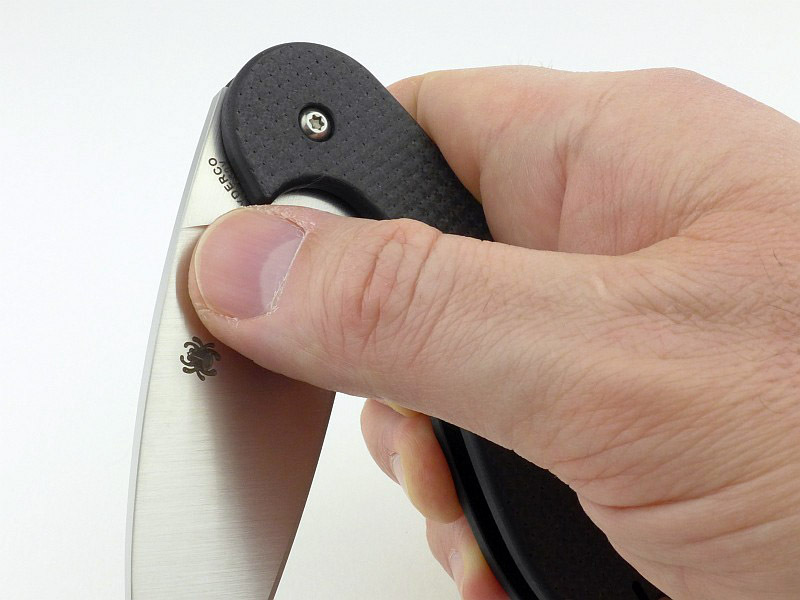 A mechanism where you have to compromise your grip on the knife to be able to press on a flipper tab to literally flick the blade open. 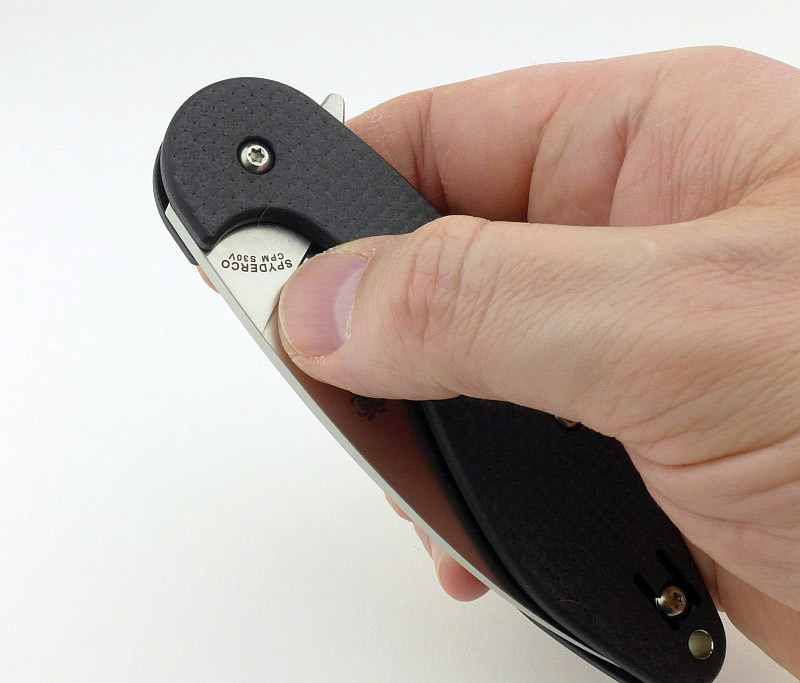 Flippers can and do fail to fully open or lock, so much like the fixed blade is your most reliable partner, the two-handed open or the properly thumbed-open blade that is positively taken all the way to the locked position, means you know 100% it is there. 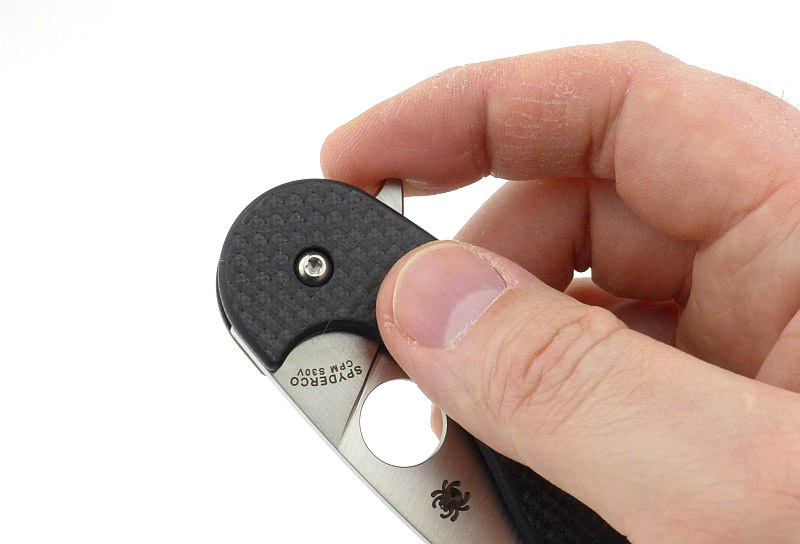 If safety and security are your primary aims, then open the blade by manually rotating it all the way. This leads me nicely into a couple of modifications I have made to the Sliverax I’ve been testing. Firstly the removal of the flipper tab. 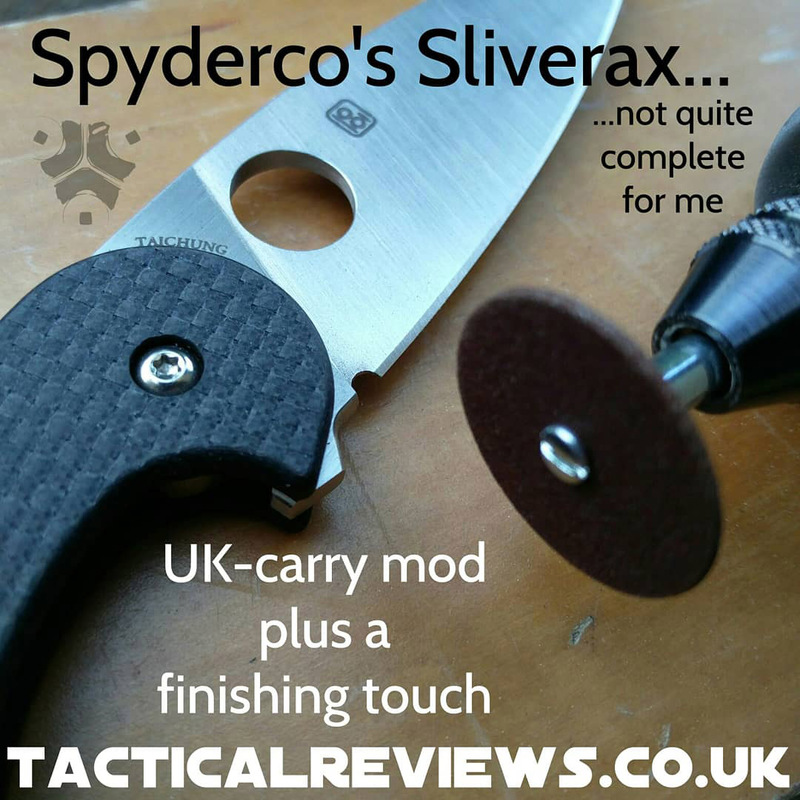 This makes the Sliverax a no-question thumb operated OHO, and has the benefit of removing the protruding flipper tab so it is even more pocket friendly. 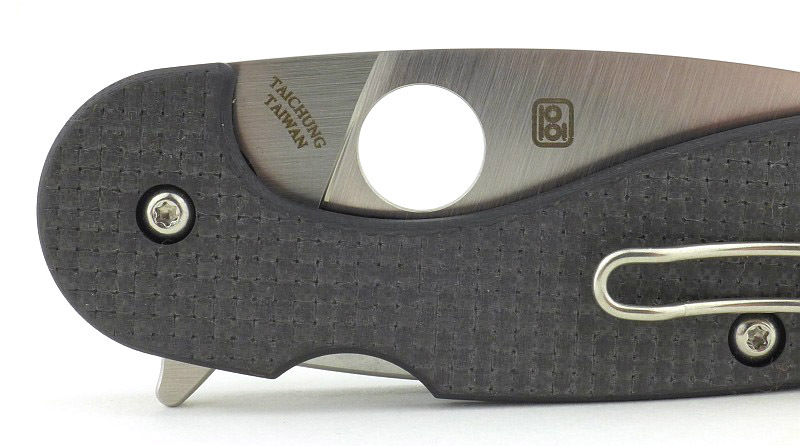 The second modification is one of those things that for me is the sign of a finished knife blade, a sharpening choil. Others will have different opinions, and I’m not saying I’m right, but it is my preference. 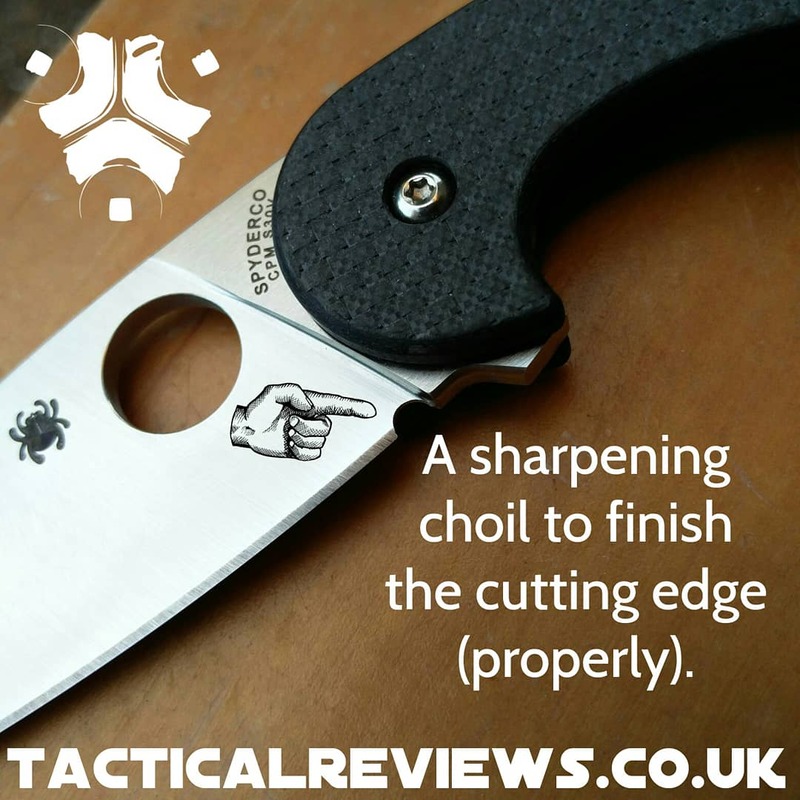 The end of the cutting edge at the sharpening choil also provide another ‘point’ for fine accurate cuts, so is not purely an aesthetic addition, but is functional too. These images are of the modification I made and posted on Instagram, hence the branding on the images. No longer a 'flipper', now just a OHO. One of my finishing touches. In the modified state (allowing me to carry it more), this knife has proven itself over and over and has become a firm favourite. The positive rake makes the blade attack each cut eagerly, with the full flat grind slicing smoothly and efficiently. 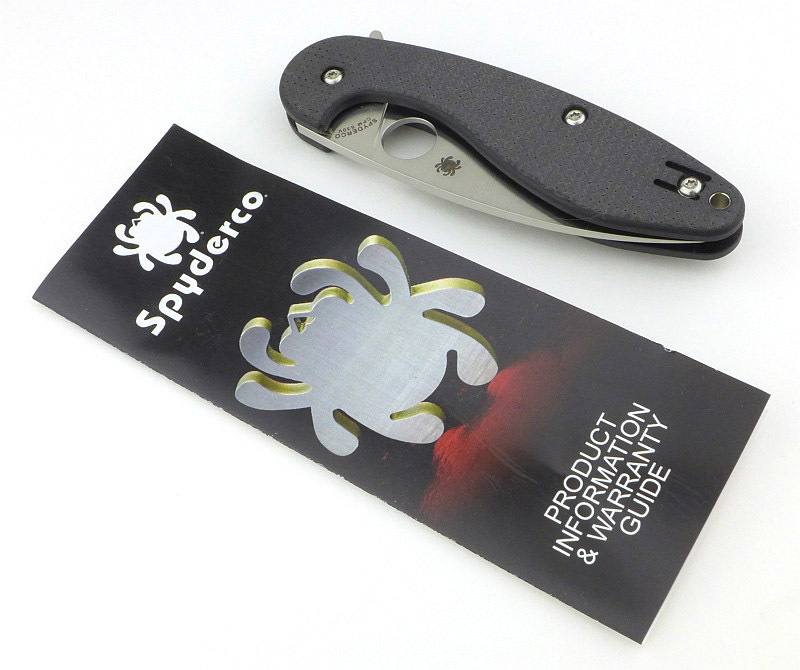 Its, lightness and pocket friendly finish and shape allow you to forget it is there until you need it. This is a knife I’ve gone from being uncertain of, to positively wanting to carry and use. Full Flat Grind S30V blade. Easy to access opening hole. Blade rake makes for a positive cutting action. Handle very thin where the first two fingers grip. 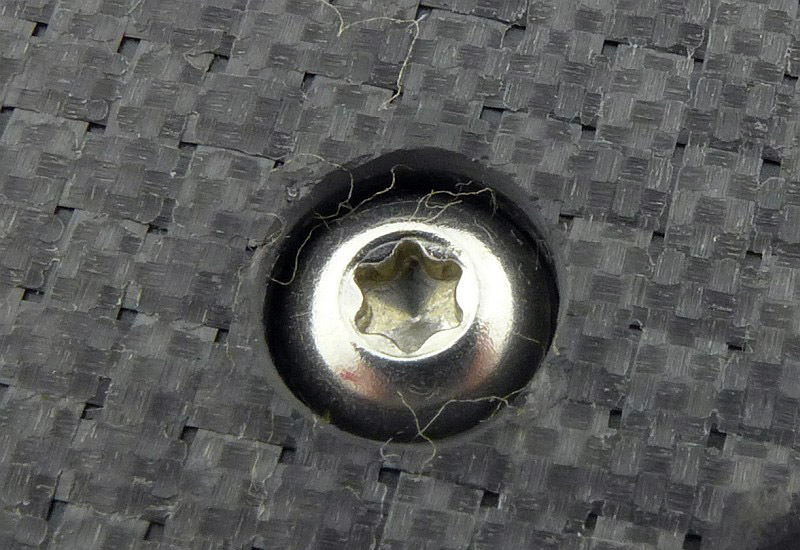 The Compression lock can ‘nip’ you.